JANAF inaugurates new facilities – HRK 280 million worth investment - JANAF Plc. Omišalj, 2 April 2019 – On 2 April 2019, Croatian Minister of State Property, dr.sc. 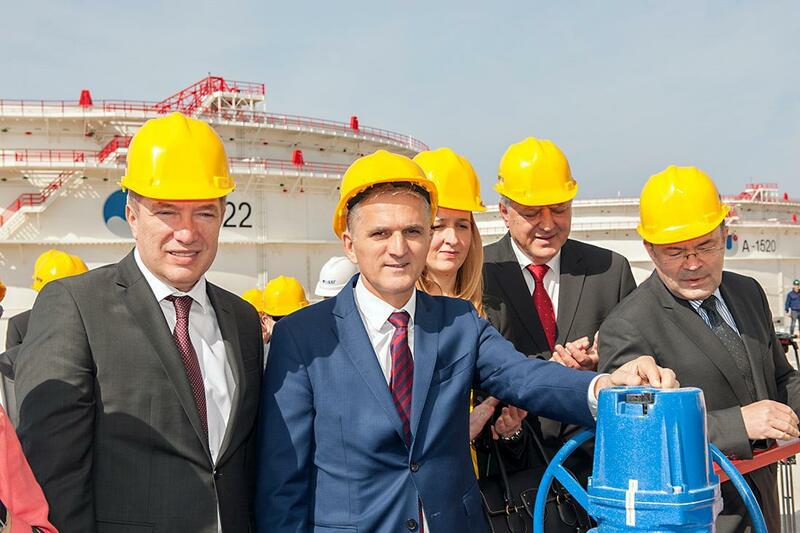 Goran Marić commissioned three newly built storage tanks intended for crude oil storing at the JANAF’s Omišalj Terminal. JANAF Plc. invested in the construction of storage tanks with related infrastructure almost HRK 280 million. The total capacity of the newly built storage tanks amounts to 240.000 m3, and thus, by their construction, the total crude oil storage capacity at the Omišalj Terminal has been raised to 1.400.000 m3. “Each new capacity in the energy industry means strengthening of actual and general security of the country, its economy and people. Our knowledge and insight need to be always fresh, recent and anticipative. Therefore, I understand the reasoning and motivation behind this project in Omšalj, which becomes an even stronger and more respectable international spot of the oil pipeline transportation system of the JANAF company. There is no step towards new technological achievement; there is no new capacity, not even the slightest, that is insignificant in the energy industry. JANAF company and all who participated in the preparations and realisations of this project, from its conception, through construction to this day, anticipated all key determinants of this investment, which strengthens a geostrategic significance of Croatia on the European and global energy map. Thus, the Republic of Croatia becomes a responsible, reliable and competitive participant on the global oil market. There is no right market, no guarantees for undertaking and performing contractual obligations towards other partners without reliable transportation and storage capacities. Therefore, the Croatian government as JANAF’s largest shareholder is supportive of business moves that ensure the technological security and constant business growth of JANAF”, pointed out dr.sc. Goran Marić, Minister of State Property, during the commissioning ceremony of new facilities at the JANAF Omišalj Terminal. “In the year of great jubilees, when we celebrate the 45th anniversary of JANAF’s existence and the 40th anniversary of its oil pipeline system operation, the construction of these three storage tanks represents the completion of the project realization related to the reconstruction-upgrades of the crude oil storage tank farm at the Omišalj Terminal. The project includes the construction of eight (8) new crude oil storage tank in total, with the capacity of 80.000 m3 each, amounting to 640.000 m3 in total, thus almost doubling the entire storage capacity at the Omišalj Terminal over the last five years. It is my pleasure to point out that this investment has also been realized by our own funds and in cooperation with local companies, which confirms that we have knowledge and capabilities even for such demanding investments, especially taking account of the protection and safety of the environment, humans and equipment. The investments into new storage capacities and oil pipeline infrastructure contribute to the creation of new values and result in achieving good business performance over several years. By this approach we make JANAF stronger, turning it into one of the best economic entities in Croatia and indispensable energy factor in the European Union and this part of Europe”, said dr.sc. Dragan Kovačević, Chairman of the JANAF Management Board, during the opening of new storage tanks. It needs to be emphasized that the Omišalj Terminal has a special strategic significance both for JANAF and the Republic of Croatia, owing to the fact that it enables the crude oil import from different areas – from the Middle East, Caspian region and Black Sea ports, as well as from African states, thus providing to the refineries on the oil pipeline route greater security of supply and various sources for choosing cheaper crude of higher quality. Besides twenty (20) crude oil storage tanks at the terminal, there are also seven (7) storage tanks for petroleum products, with total capacity of 80.000 m3 and the road loading facility.